Fave blog of the month! You are probably following OhSoAmelia yeah? If not you can find her blog here. Her blog is a parenting and lifestyle blog filled with great tips, advice, DIY crafts, Recipes and much more! 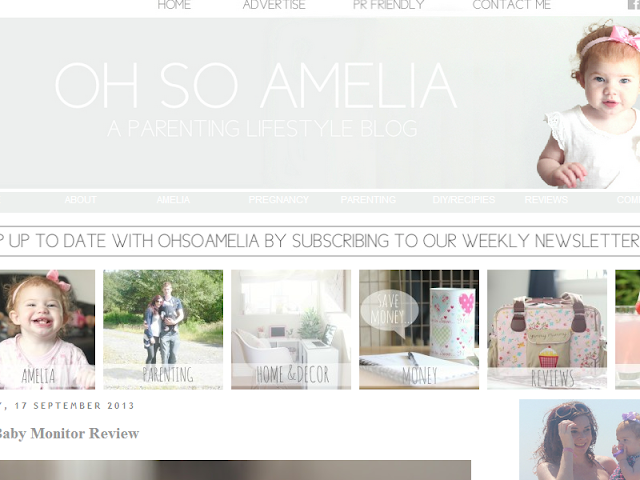 Well to start with, The blogger behind OhSoAmelia is a girl called Kerry Louise, and she is a really really nice girl! And very easy to get along with! She has a gorgeous little girl called Amelia who i have met! She is absolutely beautiful! I'll be honest i do check her blog daily! Because i love reading her posts! They're always really interesting or really helpful/useful! I've been following her blog since i started blogging and before that, It's lovely seeing how much Amelia is growing up! And really nice that Kerry's blog is so popular, she deserves it after the hard work she has put into her blog! I love her DIY Crafts that you can find here . They're unusual and she explains very well how to do them! You can tell through her blog that she is doing the blog for little Amelia - You can tell how much that little girl is loved. She is always so happy in her pictures. Another thing i love seeing on her blog is posts related to Homes ... I really do love her style it's like a vintage style, really nice! She has also reviewed a few things which are related to her blog, so if you are looking for a great review of a product you are thinking too buy, check here if she has had the product and read her great detailed and honest review. But i am back ha ha!